A smart and multifunctional work desk. 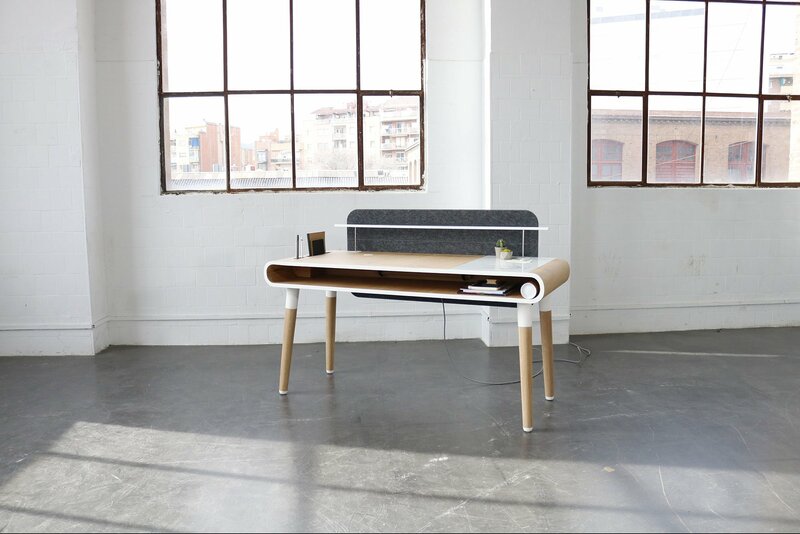 Designed by Spanish studio Köllen Design, this innovative desk provides a thoughtful solution for modern workspaces. The Köllen Eget desk features the studio’s favored blend of form and function. Made with a Nordic-inspired aesthetic, the desk looks great anywhere, whether in a sleek office or in a cozy home. While elegant and versatile, Köllen Eget truly impresses with its list of practical features and adaptability. The ingenious and dynamic design molds to the needs of the user to provide a custom work area. Mobile components transform the desk and adapt it to changing requirements. Removable sound panels provide a convenient way to separate the desk from the rest of the room and create a quieter working environment. The integrated magnetic board is perfect for taking notes and putting important info on display. Storage spaces allow the user to keep important materials on hand and to also organize cables. Smartphones charge quickly thanks to the integrated wireless charger, while two USB ports and four individual sockets expand the charging options further. Finally, the desk also comes with a lamp that features a movement and intensity sensor. Made by hand from high-quality materials, every desk boasts one-of-a-kind details in the wooden surfaces, including small imperfections that give the furniture more character. Exhibited at the Milan Furniture Fair 2018, Köllen Eget is available to order from the studio’s website. Photographs© Köllen Design.